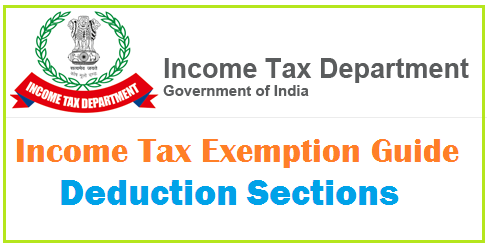 Income Tax Exemption Guide, Deduction Sections for the Financial Year 2018-2019 Assessment year 2019-2020, Income Tax Exemption Guide For The Financial Year 2018-2019 financial year 2018-2019, Income Tax Programme for AY 2018-2019, IT Income Tax Software FA 2018-2019. Income Tax Programme for AY 2019-2020, Income Tax Software 2018-2019, IT Software 2018-2019, IncomeTax Programme 2018, IT Programme 2018, Download IT Software 2018-19 for Financial Year 2018-2019-Assessment Year 2018-2019. AP and Telangana Teachers, employees Income Tax Software 2018-2019. 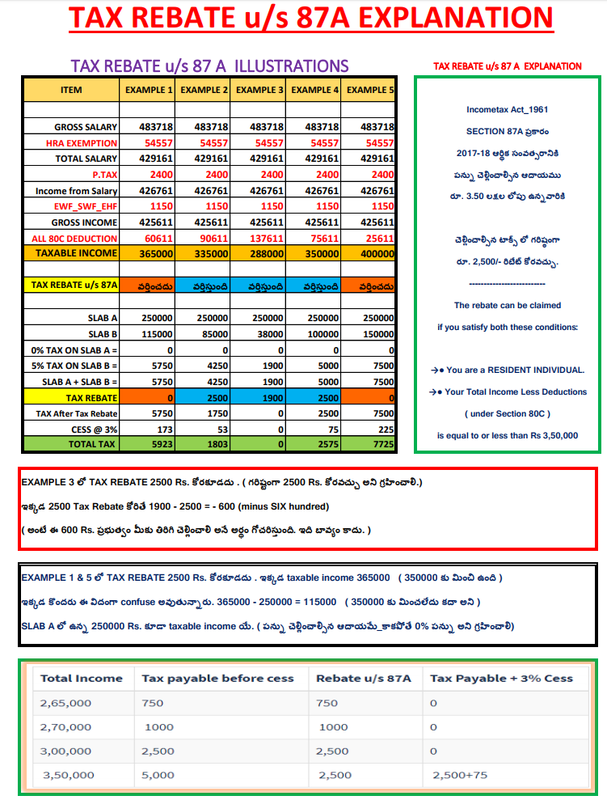 Important sections of the Income Tax - Tax rebates under section 87A Illustrations. Important sections of the Income Tax Act you should know about. If you have invested in avenues such as ELSS Mutual Funds, National Savings Certificates, Life Insurance Premiums, MF-Pension Plans, National Pension System, you can claim tax deductions under Section 80C. The maximum tax exemption under Section 80C is Rs. 1,50,000 for FY 2018-19. This applies to anyone who has contributed to any pension scheme operated by the Government of India (like the National Pension System). You can claim tax benefits equal to the contributed amount (not more than 10% of your salary) and an additional Rs. 50,000 under Section 80CCD. The Section 80CCG or Rajiv Gandhi Equity Savings Scheme deduction was introduced to encourage investments in equity shares. Under this section, you can get tax deductions up to 50% of the amount you have invested in equity shares or Rs. 25,000, whichever is lower. Have you invested in Health Insurance for yourself and your family (this includes your spouse, parents and dependent children)? If you answered yes to that question, then you can get a tax deduction of Rs. 25,000 on your Health Insurance premium under Section 80D. If the insured is a senior citizen (above 60 years of age), he or she will be entitled to a tax exemption of Rs. 30,000. Furthermore, you can claim medical reimbursements up to Rs. 15,000 (under Section 17(2) of the IT Act) from your employer, by submitting the medical bills. This amount is not taxable. Under this section, a tax deduction of Rs. 40,000 (for individuals below 60 years of age) can be claimed on the grounds of medical treatment for specified ailments such as cancer, AIDS, chronic renal failure, thalassaemia, etc. You can claim this deduction for yourself or on behalf of your dependents. However, you have to submit a prescription from a specialist doctor to claim it. The interest you earn on your savings accounts in a bank, post office or a co-operative society is exempt from tax for up to Rs. 10,000. This tax exemption is not applicable on interest earned via Fixed Deposits. This section applies to taxes on gifts. If you receive gifts (in the form of cash, cheque, etc.) with a value of Rs. 50, 000 (or less) from anyone other than your blood relations, then you don’t have to pay tax for the same. If the value of the gift is more than Rs. 50,000, then the full amount is taxable. Gifts from blood relations are 100% tax-free. Under Section 10(14), the Budget FY 2016-17 lets you claim Rs. 19,200 tax exemption as transport allowance and Rs. 2,400 tax exemption as Children Education Allowance (CEA) in a financial year. For salaried individuals living in rented houses, the House Rent Allowance (HRA) is a great tax saving option. The tax benefits that you get depend on your basic salary, HRA provided by your employer, your place of residence and the rent you pay/declare. If you have taken a Home Loan, then you can claim a tax deduction on the interest component of the loan under Section 24(b). For self-occupied properties, you can benefit from deductions of up to Rs. 2,00,000. Have you made contributions to charitable organizations and relief funds? You can claim tax exemptions up to 50% of the amount, if you have paid via cheque, draft or cash (not exceeding Rs. 10,000). Contributions made to a few select organizations can get you 100% tax exemption. A tax exemption option for Indian companies, Section 80GGB provides 100% exemption on any amount contributed by a company to political parties or an electoral trust. 1. Your home loan was sanctioned in the financial year 2016-17. 2. The loan amount does not exceed Rs. 35 lakh. 3. The value of your house is within Rs. 50 lakh. 4. You should not have any other residential property in your name. If you have taken a loan for higher education after the completion of your Senior Secondary Exam, then you can claim a tax deduction under Section 80E on the interest paid towards the loan. The loan should have been taken for higher education for yourself, your spouse, your children or any student for whom you are the local guardian. This deduction can be claimed for up to 8 years or till the interest is paid, whichever is earlier. There is no limit on the amount of interest you can claim for tax exemption. 2. Premium / Subscription for deferred annuity For individual, on life of self, spouse or any child . 3. Sum deducted from salary payable to Govt. Servant for securing deferred annuity for self-spouse or child Payment limited to 20% of salary. 4. Contribution made under Employee’s Provident Fund Scheme. 5. Contribution to PPF For individual, can be in the name of self/spouse, any child & for HUF, it can 6. be in the name of any member of the family. 7. Contribution by employee to a Recognised Provident Fund. 10. Subscription to any notified savings certificate, Unit Linked Savings certificates. e.g. NSC VIII issue. 12. Contribution to fund set up by the National Housing Scheme. 14. Tuition fees paid at the time of admission or otherwise to any school, college, university or other educational institution situated within India for the purpose of full time education of any two children. Available in respect of any two children. As per the Budget 2012 announcements, a new scheme Rajiv Gandhi Equity Saving Scheme (RGESS) will be launched. Those investors whose annual income is less than Rs. 10 lakh (proposed Rs. 12 lakh from A.Y. 2015-16) can invest in this scheme up to Rs. 50,000 and get a deduction of 50% of the investment. So if you invest Rs. 50,000 (maximum amount eligible for income tax rebate is Rs. 50,000), you can claim a tax deduction of Rs. 25,000 (50% of Rs. 50,000). Deduction in respect of Various Donations 100% or 50% without Restrictions.